Since our start as a design studio, we have been heavily involved in designing original Arabic typefaces, and through our 10 years of design practice at Tarek Atrissi Design, we have left a visible mark on the typographic landscape. Our fonts are to be seen used across the Arab world, in print, on air, on newspaper headlines and as part of elaborate corporate identity systems. The last two years haven’t been an exception: we have designed several corporate and custom Arabic (and bilingual) fonts for different clients, many of which we haven’t posted yet on our blog or website. One font I am particularly proud of and excited about is the font I am sharing in this blog post. 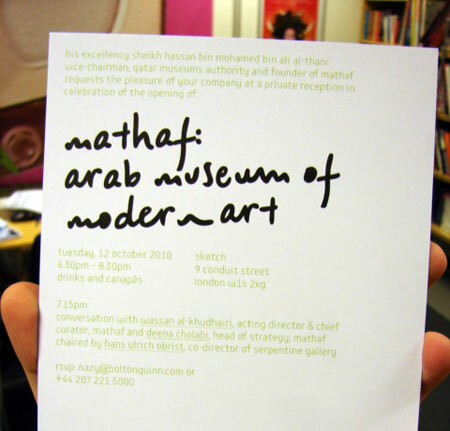 The custom display font for the Arab Museum of Modern Art, “Mathaf”, a new museum opening today in Doha – Qatar through its inaugural exhibition “Sajjil”. The Arabic and Latin font is the result of months of intensive work, and is one of the main components in the visual identity and branding adopted for the museum. Unlike many of the typical briefs we usually get for designing custom fonts, this typeface design commission for such a high profile organization was really out of the box. It challenged us to put into it the creativity and experimentation that we usually put into self initiated type design projects. The bilingual typeface we were asked to design was more of an artist experimentation: It had to look far from a digital typeface, but rather a hand scribble; a personal signature; a quick spontaneous-looking hand writing that looks more like a scribble taken from an artist’s sketchbook. This request was a particular design challenge. Especially for an Arabic font as anyone would imagine: Creating the illusion of a hand written scribble in a script that has connected letters was a tough task. Which might explain why as a matter of fact there aren’t this sort of digital Arabic fonts available out there. The design process was very exciting and defined by experimentation. In the first phases of the project we explored all sort of manual lettering work. The focus was on finding the right formula to create a spontaneous writing style, while keeping in mind the challenge of matching the Arabic and Latin parts of the font to communicate the same spirit. 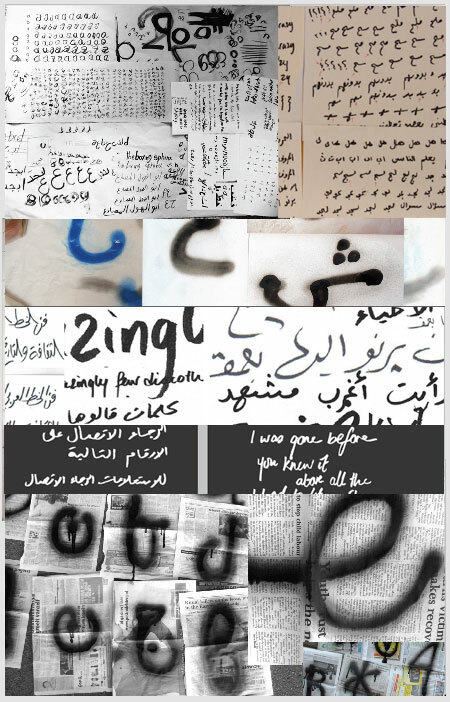 There is basically nothing we did not try: Creating metallic brushes from Coca-Cola cans and writing with it; Graffiti writing on large newspaper sheets; Asking extended family to write quickly in charcoal pens; and looking in our archive for collected old Arabic newspapers which still used manual hand calligraphy for typesetting all headlines. Several design rounds made us finally use the outcome of a specific handwriting that filled in our stack of sketches. This material was scanned, digitized, and then developed and refined further to create the basis of the design. Twenty two rounds of presentations were needed to polish the final design. 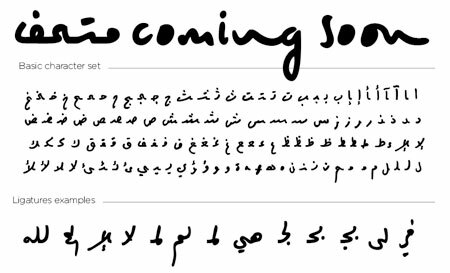 The final character set, particularly in Arabic, included a wide set of ligatures that allowed a more natural flow of the script. The final design echoed in one way or another some of the initial inspirations we used while developing this typeface: street hand made lettering that could be found in different sizes, forms and textures- and that I have for long documented as part of my visual research. Previews of the final font, as well as some selected samples of from the process, are shown as part of the images showcased here. Without being labeled as an Arabic font with calligraphic features or a font with contemporary typographic features, the Mathaf-script typeface is above all a font reflecting a personal expression. An expression that is maybe typical to any piece present in a Museum of Modern Art. To me personally, regardless of the final outcome of the design, the simple fact that we were commissioned for this project is a double rewarding honor: On one hand, it is a confirmation that the type of Arabic fonts we have often focused on developing are highly in demand: Fonts designed by graphic designers for graphic designers; fonts that have strong characters and that are ideal for usage in corporate design and branding context, and that are designed to communicate a very specific mood or message. On the other hand, by being asked to take part of visualizing the written voice of “Mathaf”, we are in one way or another given the honor of being part of Arab modern art, typographically speaking at least. 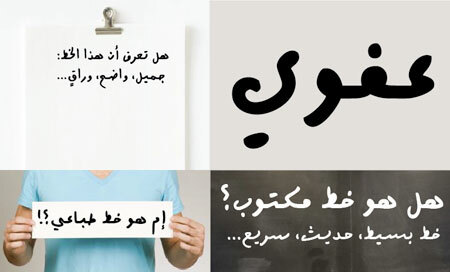 Above: Samples of the font usage within the branding and identity system of Mathaf. Showing the countdown posters for the opening event; application of the font on pins and printed matters; and screenshots from promotional video using the font for on-screen titles.